Peace, joy and love will never go out of style, and is there anything more you could wish upon those you love most? 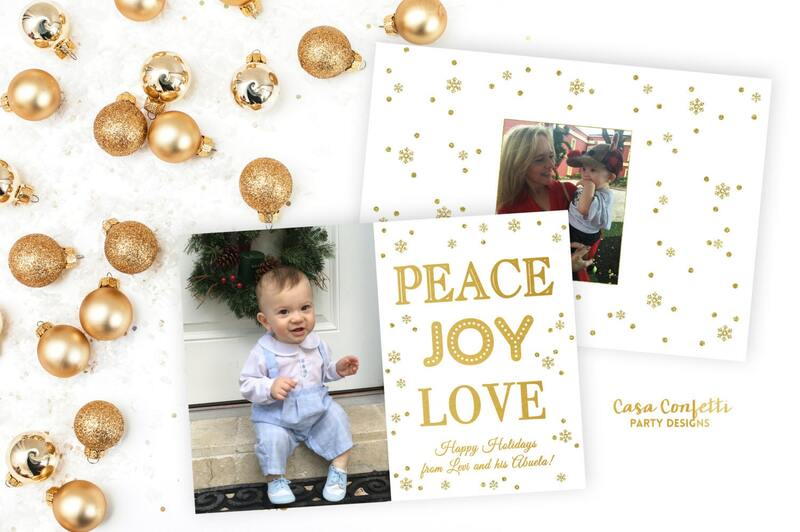 Let your photo shine with this beautiful white and gold holiday photo card. So classic! This listing allows you to either purchase the digital file only, or to purchase as many PRINTED greeting cards as you need. Simply select the option you desire in the drop-down menu. Both options include a FREE matching back for an elegant and polished look. Printed cards start at only $1.67 each, and this price includes double-sided printing (design on front and back!) on super high-quality, ultra-thick paper, along with shipping and envelopes! This is a great price for the quality that you will receive. Need a different quantity? Convo me and I will set up a custom listing! SIGNATURE: Signature paper is an ultra-thick 130 lbs and has a soft, rich texture. This is as high-quality and luxurious as it gets! SHIMMER: Shimmer paper is an ultra-thick 130 lbs and adds a nice, subtle shimmer to your design. Ultra-feminine and great with glittery and gold designs! STANDARD: This paper is a bright white 120-lb card stock with a bright white smooth finish and a coated surface. It's great for showing off bold contrast in color and crisp text. Each option is super high quality! You really can't go wrong with any of them. If you purchase the DIGITAL FILE ONLY, you will receive a PRINTABLE 5x7 invitation with a matching back. Card is designed to fit in a standard A7 envelope. Note that selecting the "Digital File ONLY" option is for a printable digital file delivered by email. No physical product will be shipped to you. You can print at home or take the file to a print shop and have your invitations professionally printed. For best results, print on white card stock, 110-lb or greater. • Family name (or name, i.e. "The Abrams Family" as shown above)-- text is fully customizable, so just indicate what you'd like it to say! Then email a high-resolution photo of your choice as an attachment to casaconfettishop [!at] gmail.com. Once you approve the proofs, your print-ready, high-resolution files will be emailed to you if you selected the digital file only option. Watermark will not appear on final item. If you ordered printed invitations, please allow 7-10 business days for delivery (2 days for printing/packaging, and 5-8 days for shipping).